Britain’s national airline will make a rare airshow contribution at this summer’s Royal International Air Tattoo at RAF Fairford. A British AirwaysAirbus A318, one of the rarest aircraft in its fleet, will go on static display at the airshow on July 17-19. The A318serves a route aimed at the business community between London City Airport and New York’s John F. Kennedy Airport. It is unique among aircraft types in the British Airways fleet in operating with an all-business class interior comprising 32 seats, each convertible into a fully flat bed. 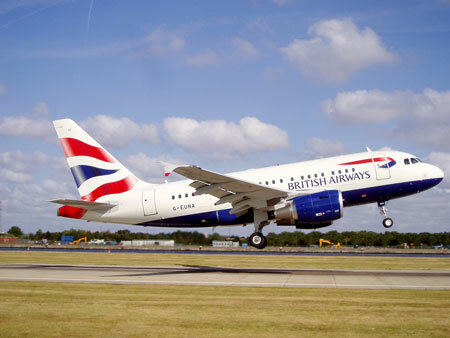 British Airways flies just two A318s, this being the smallest member of the hugely successful Airbus A320 family of aircraft. In order to be certified for operations at London City, the A318 was subject to a stringent steep approach test programme, the airport requiring specific operational procedures. This the Airbus passed with flying colours, the first example being delivered to British Airways in September 2009. The BA A318 joins Vulcan bomber XH558, a C-130J Hercules from Qatar and a Super Puma from the Swiss Air Force as confirmed participants at this summer’s airshow. The Swiss are also sending their PC-7 aerobatic display team. The Air Tattoo is staged annually in support of the RAF Charitable Trust. Tickets for the event on July 17-19 are only available in advance. Special Super Earlybird tickets priced from £26 are available until January 31 from www.airtattoo.com or by calling 0800 107 1940. All accompanied under-16s go free. Free parking. Qatar will make its UK airshow debut this summer when it takes part in the Royal International Air Tattoo at RAF Fairford in the Cotswolds. The Qatar Emiri Air Force will send for the show’s static display a C-130J-30 Hercules transport aircraft, one of four such aircraft delivered to the small but strategically and economically-important Arab state by manufacturer Lockheed Martin in 2011-12. 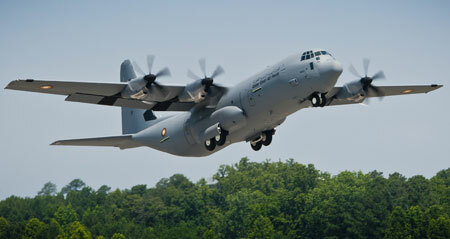 Qatar thus became the first Middle Eastern customer for the C-130J model. Based at Al Udeid Air Base in Doha, the country’s capital, the C-130J-30s -the stretched version of the so-called Super Hercules – and four Boeing C-17A Globemaster IIIs have provided Qatar with a much-improved air transport capability, for use on both military airlift and humanitarian taskings. The Qatari aircraft joins the legendary Vulcan bomber and Swiss Air Force aircraft on the list of early confirmed participants for this summer’s Air Tattoo on July 17-19 and brings to 55, the number of nations that have taken part in the airshowsince it was first staged in 1971. The organisers of the RAF Cosford Air Show today announced details of the first international participant for this year’s show. 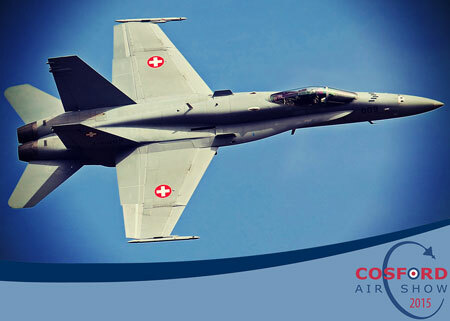 Visitors on Sunday 14th June will be treated to a stunning display of noise, power and agility from an F/A-18C Hornet provided by the Swiss Air Force. Visitors to the show will be witnessing one of the world’s most capable fast-jet aircraft with the F/A-18C Hornet having a top speed of nearly twice the speed of sound and the ability to climb at 50,000ft per minute.The Swiss Air Force operate a fleet of 32 Hornets, which are used for air defence duties, armed with a 20mm Cannon and Sidewinder missiles. 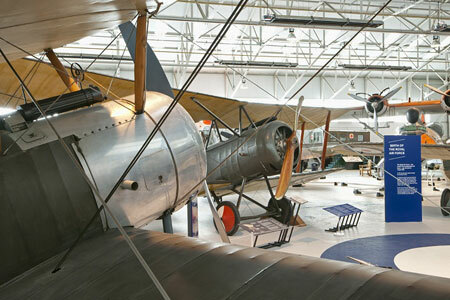 This week the Royal Air Force Museum Cosford officially unveiled a brand new exhibition area celebrating the achievements of Britain’s air services, the Royal Flying Corps (RFC) and Royal Naval Air Service along with the contributions made by the West Midlands in the race for the sky during the First World War. The exhibition entitled ‘First World War in the Air’ has been made possible with a grant from the Heritage Lottery Fund (HLF) with support from BAE Systems and is now open for visitors to enjoy. The exhibition was officially opened by Brendan Connor, Deputy Chairman of the RAF Museum Trustees in the presence of Fi Stephens, Grants Officer from the HLF and Directors from BAE Systems, with key partners and invited guests. The ‘First World War in the Air’ is a new permanent exhibition that will enable visitors to discover and explore the unique and often overlooked role of air power during the First World War through the incredible stories of the men and women who served and protected our nation in the earliest days of military aviation in Britain’s air services. The exhibition uses the RAF Museum’s world-class collection of aircraft, documents, film and photographs to reveal how aviation changed the character of war forever. Set amongst the Museum’s collection of warplanes, three iconic First World War aircraft; the Sopwith Pup, Sopwith 1 ½ Strutter and the Bristol M.1c form the centre piece of the new display. The Sopwith Pup was used extensively during the First World War by the Royal Naval Air Service and the Royal Flying Corps and considered the perfect flying machine by its Pilots. The Bristol M.1c and the Sopwith 1 1/2 Strutter are full scale reproductions. Displayed alongside the aircraft are the personal items of Second Lieutenant Kevin Robert Furniss of the RFC, who lived only a few miles from Cosford in Wolverhampton. Donated to the Museum in 2013 by his great niece, Kevin’s belongings included documents ranging from baby photographs and school reports to obituaries and memorials, telling the story of Kevin’s tragically short life. Artefacts on display include Kevin’s RFC flying helmet and wings, a complete wash kit and a letter to his father all returned to his next of kin following his death. The personal letters between Kevin and his family and friends provide an insight into the personality of this brave young man and his experiences during the First World War. Today also marks the launch of a brand new First World War workshop for school groups entitled ‘Life above the Trenches’. Year 6 pupils from Albrighton Primary School attended the opening event and took part in a variety of activities throughout the day, including readings from Writer in Residence Tom Palmer based on the letters of Second Lieutenant Kevin Furniss (RFC). This new workshop will help children understand how our knowledge of the past is constructed using a range of artefacts. Focusing on the life of a Royal Flying Corps (RFC) pilot, interactive activities will introduce children to the history of the RFC with the opportunity to examine First World War artefacts including uniform, maps letters and aircraft in order to build a picture of the life of a pilot. Any schools interested in the ‘Life above the Trenches’ workshop can book their place now by contacting the Museum’s Access and Learning team on 01902 376243 or email learning-cosford@rafmuseum.org. In December 2014 the RAF Museum successfully opened a major new ‘First World War in the Air’ exhibition at its London site and today’s exhibition opening at Cosford marks the first step in a joint transformation of the Museum at both its sites, in advance of the Centenary of the Royal Air Force in 2018. The popular BBC One antiques programme Flog It presented by Paul Martin, is coming to London on Thursday 29th January 2015. Flog It – the major BBC antiques show is now on its fourteenth series and regularly achieves an audience of over two million viewers in its weekday afternoon slot. RAF Museum London will be hosting the Flog It valuation day. Rather like a treasure hunt, members of the public are invited to bring along up to three antiques and collectables they might be interested in selling. Once valued, the owner and a team of experts decide whether an object should go forward for auction. If the item is chosen it is included in a sale a few weeks later – hopefully when the auctioneers hammer falls its owners make a tidy sum. Everyone who goes along to the Valuation Day will receive a free valuation – even if their antiques are not chosen to go forward for auction. The show recently made a significant find when a rare Aboriginal Broad Shield that had been kept hidden away in a Flog It viewers wardrobe was brought along to a valuation day in North Lincolnshire and went on to sell at auction for £30,000! The series also uncovered an unusual Royal Doulton Spook figurine in Blackpool which had been bought at a car boot sale for £2; it went on to sell at auction for £5000. Paul Martin will be joined on the valuation day by Flog It on screen experts Anita Manning, Mark Stacey and Michael Baggott. The BBC are planning to transmit the four editions of Flog It featuring RAF Museum London within a year of recording. Flog It will be at RAF Museum London, Grahame Park Way, London, NW9 5QW on Thursday 29th January 2015 between 10.00am and 4.30pm. The items selected at the valuation day will go under the hammer at Chiswick Auctions, 1 Colville Road, London, W3 8BL on Tuesday 17th February 2015. Firstly the RAF Cosford Airshow, which failed to make the shortlist until last year when you voted it into 2nd place has this year been voted “Best Airshow” by Airscene visitors. Airscene reviewer Dave Briers praised RAF Cosford efforts to sort out previous years access and traffic issues, and cites the harnessing of resources such as the RAF Museum as contributing to the overall pull of Cosford…. “Organisation and Innovativion with a “Can & Will Do” attitude – that’s Cosford!“. No change in the order of the top 3 for the Best Aviation Museum as RAF Cosford Museum hangs on to first place for the 2nd year running. Duxford stay in 2nd place while the Fleet Air Arm Museum stay in 3rd albeit with a lot less votes than 2013. The most interesting battle always seems to come from the “Best FREE Airshow” award.. Bournemouth and Eastbourne both stay in the top 3 again this year, but it was the Devon faithful out in force this year to help secure the award for Dawlish Airshow. In the Best Solo Display category it was the Typhoon which triumphed this year, with Vulcan XH558 and the RAF Chinook taking 2nd and 3rd place respectively (both having won this award in previous years). There has been so much commentary and an outpouring of emotion, not to mention silencing of crowds up and down the length of the UK; whenever the BBMF put in an appearance in 2014, as the public lapped up the sight of not one but two Lancaster Bombers flying side by side – truly a once in a lifetime event! So what happened here??? Well – the Red Arrows won again – that’s what, and for the 4th year in a row! BBMF grabbed 2nd place and The Blades came 3rd. This shouldn’t perhaps be a surprise as the Red Arrows are truly as British as Bangers & Mash, and in the good old game of Rock, Paper, Scissors – excitement beats nostalgia. 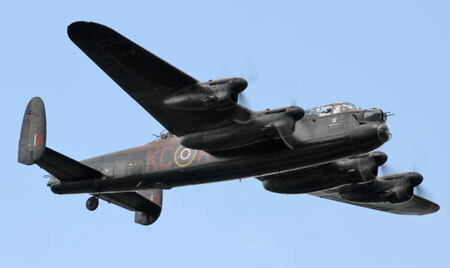 Maybe at the end of the day, the BBMF and the Canadian Lancaster needed a category of their own this year. So the award for the “Best Tugger of Heart Strings” goes to…. ONE of the world’s most iconic aircraft will touch down at RAF Fairford in the Cotswolds this summer to take part in the Royal International Air Tattoo. Vulcan XH558 is the only flying example of this large Cold War bomber having been restored to flying condition in 2007 following a public fundraising campaign by the Vulcan to the Sky Trust (VTST). Since then, displays by the aircraft, demonstrating both its grace and immense power, have been among the most eagerly-anticipated on the UK airshow circuit. Based at Robin Hood Airport in Doncaster, XH558 is the first aircraft to be confirmed for the airshow which takes place on July 17-19. 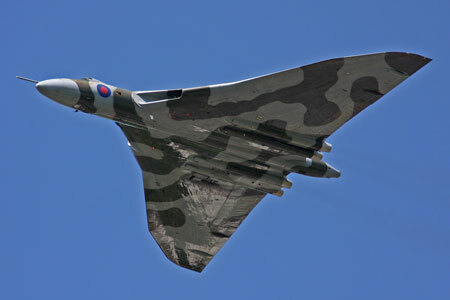 Named The Spirit of Great Britain, Vulcan XH558 will fly into RAF Fairford on Friday, July 17for a special ‘Pit Experience Day’ offering people close access to the aircraft and the opportunity to meet members of the Vulcan to the Sky team and the dedicated band of volunteers who help keep the aircraft airborne. The aircraft will perform two flying displays during its visit, one on Saturday July 18 and the other on Sunday July 19. Weekend visitors will also be given the opportunity to visit her on the ground in return for a small donation toVTST. Air Tattoo Chief Executive Andy Armstrong said: “The Vulcan is arguably the most popular historic aircraft flying today and I am delighted that we’re able to welcome her back to the Air Tattoo this summer. “What better way to launch our 2015 theme Securing the Skies – Past, Present and Future than with an aircraft that performed a crucial role in the UK’s strategic nuclear strike force during the Cold War, on standby 24 hours a day with crews ready to launch the aircraft with two minutes’ notice. More details on each event will be issued closer to the time. Some events may incur a small participation fee and additional events may be added during the year. For further information on forthcoming events taking place at the RAF Museum Cosford in 2015, please contact the Museum on 01902 376200 or visit www.rafmuseum.org.